Even though deceased stars no longer show up to parties, you'd be dead wrong to think their delicious reputations have also left this earth. 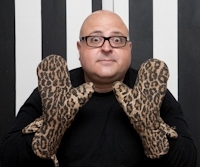 At least, so says Frank DeCaro, the author of The Dead Celebrity Cookbook. Part TMZ, part Martha Stewart and sprinkled with the psychic intuition of Miss Cleo; the book features a unique collection of recipes from over 145 famous people that also happen to be dead. Frank was kind enough to take a few moments out of his busy day to talk with Paranormal Pop Culture’s to dish about exhuming the refined palates of dead celebrities. Paranormal Pop Culture: Of all the celebrity kitchens you could raid in today’s bevy of living stars, why did you choose to publish a cookbook of recipes from dead celebrities? Frank DeCaro: I thought they needed me. I did. I thought someone had to keep their memory alive and I thought food was a really good gage. I do a show on Sirius/XM Satellite radio and we get new interns every three months. They’re 20 years-old and they never know what the hell I’m talking about. I really wanted to pass this information along to them so people of this generation would know about some of these performers that influenced my life and so many of our lives. I wanted to keep their memories out there, that was my impetus for doing the book. PPC: It’s the obligatory question so I’m going to get it out of the way early, what is your favorite dead celebrity recipe? FD: Don’t laugh. My favorite dead celebrity recipe is Liberace’s Sticky Buns. Not only are they incredibly delicious, but he has the best title of any recipe I’ve ever seen. I choose to believe that they prove that he was in on the joke and if he wasn’t in on the joke of how funny Liberace’s Sticky Buns sounds, then it’s just sad. So I prefer to think that he got the joke. They’re just delicious and so much more fun than you would think of something that started out as a crescent roll from the dairy case would taste. PPC: Was there a recipe that you’ve heard of but couldn’t get? FD: There were some that I’d heard of but I have so many. I have enough to do volume two, three and four … I have been collecting anything that had a celebrity recipe in it whether it was a magazine article or a microwave oven manual from 1975 or pamphlets that were handed out in supermarkets, you know, the meat department of supermarkets in the '60s. Anything I could find at flea markets or on eBay I bought over the last 15 years and so I ended up with this treasure trove of recipes. I also wanted to keep these people alive, or at least their spirit alive. As much as I wanted to get people in the kitchen and cooking, I wanted to get them into the TV room so they could discover this wealth of entertainment that existed before some of us were born or just too little to really appreciate it. PPC: Of all the stars listed in the book, which dead celebrity would you most like to have dinner with? 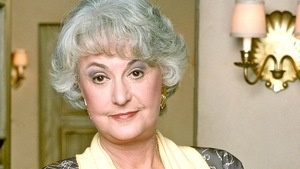 FD: I would most like to have dinner with Bea Arthur. I’ve met her on a number of occasions and she kept us in stitches while we were talking to her. I think if she was that much fun without a glass of wine, how much fun would she have been if we had been having dinner together. PPC: Dinner and a piece of cheesecake? PPC: Do you think you had more fun tasting the dishes or dishing about the celebrities? FD: It was very fun for me to do the book on any number of levels because I was able to put all of my interests together. I’m a really good cook but I’m a much better eater. So, that’s part of it. I eat, sleep and think pop culture; I’m really pop-culturally obsessed and so being able to dive in to this project was great for me. And when the research for the book is to find 5 episodes of Bewitched that are food oriented and then watch them, that’s my kind of research. It was fun finding the episode where they conjured up Napoleon Bonaparte instead of a Napoleon Pastry and Julius Caesar instead of a Caesar Salad, it’s pretty funny…and that’s the research. PPC: Where did you get the recipe for Michael Jackson’s Sweet Potato Pie and do you think he ever cooked a day in his life? FD: I don’t know if he cooked it, but I certainly hope that he enjoyed it. I really believe that he enjoyed sweet potato pie. I found Michael Jackson’s recipe, or the recipe attributed to Michael Jackson, in some sort of southern California high school spiral bound charity cookbook. When I found that, I thought “oh this is good one.” I was surprised. And you know what? It is a really delicious pie recipe. PPC: It looks wonderful but I was so shocked. I thought, really? Michael Jackson has a Sweet Potato Pie recipe?! FD: The one that I catch hell for is Karen Carpenter’s Chewy Pie. I didn’t tell her not to eat it! I really did it because I want people to know about Karen Carpenter. She had one of the finest voices of the twentieth century. You listen to her music and it’s like, that’s what pain sounds like. She was amazing. PPC: You change or “improve upon” some of the recipes in the book in various “post-mortem” sections. Do you believe in zombies and if so are you worried that certain more gruesome dead celebrities are going to rise out of their graves and come after you for changing their ingredients? PPC: You had a visitation from your father? FD: Yes, my dad passed away a year ago on Dec. 23 and this Dec. 23 (2011) we got home, we had been out to dinner, and when we got back I thought “God, it’s hot in here.” In 49 years of either living there or visiting there, never once has anyone ever hit the thermostat and turned it up as far as it could go. It was boiling hot in that house. The next day we smelled his cologne in a bathroom we hadn’t used in months. You know, we’d used it and cleaned it since he died but for some reason from the center of the room was the smell of his cologne and I thought, “Oh my gosh.” And then the next day we got locked in the garage and that had never happened before. I thought, “I’m being punked by my dead father!” Somebody told me that the thing to do next time is to make sure we acknowledge that we know he’s there. Now, whenever we go there we say, “hey pop, we’re home,” just the way we would have done when he was alive. You never know, maybe it’s all true …who knows? It certainly felt different than when you dream about someone. I mean, never once was I locked in that garage, never once. PPC: You mention in the book that you host an extravagant bonanza every year for the Oscars. Dare I ask what’s on the menu for this year’s party? FD: I think this year we are going to cook out of The Dead Celebrity Cookbook. We’re going to make some of the recipes that are in the All-Night Oscar Buffet chapter. I’m going to make the Cocktail Olives wrapped in cheesy pastry dough, Claudette Colbert’s Cheese and Olive Puffs, and I’m going to do maybe Joan Crawford’s Poached Salmon and Bette Davis’ Red Flannel Hash the next morning. I always wanted to do an all-night Oscar buffet so hopefully we’ll get to do that this year. PPC: What do you think your next venture will be and will it include more deceased members of society? FD: What I’m going to be doing this year, that I’m very excited about, are two smaller versions of the book that are going to be dedicated to movie legends and musicians. What I’m also really excited about is a Dead Celebrity Christmas Cookbook to be released in the Fall. It will feature performers who are iconically linked in some way to Christmas. You can listen to Frank weekdays at 11am ET on The Frank DeCaro Show on Sirius/XM Satellite Radio or follow him on Twitter at @frankdecaroshow. 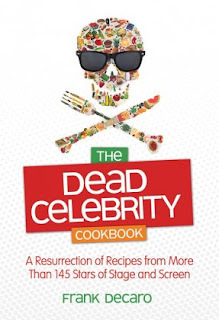 To find out more information on The Dead Celebrity Cookbook, visit www.deadcelebritycookbook.com.